I’m certified in what? Hootsuite! On October 9, 2013 I officially became Hootsuite Certified! A division of Hootsuite, Hootsuite University allows you to become a certified Hootsuite professional. I was given the opportunity to do this through Dr. Freberg’s social media class at the University of Louisville, luckily enough for free. But how did I become certified? Literally, I watched a series of very educating videos and then took exams. The videos ranged in topic from the Hootsuite dashboard functions to up to date information about social media and even some social skills. I am Hootsuite Certified because I passed the exam. But why is it important to be Hootsuite Certified? Below is the Congratulations I received once passing the Hootsuite Certification Exam, with a 99% if I don’t mind saying! Before the social media class that I am currently in, I had never even heard of Hootsuite and now, barely even 2 months later, I am a certified Hootsuite professional! I mentioned how that it possible, but again why is it important? Having this certification allows other professionals or even potential employers to know that you for one have knowledge of social media, but specifically you have a more in-depth knowledge in the Hootsuite dashboard, which is becoming more important by the day. I’ve discussed what exactly Hootsuite is in a previous blog, in case you aren’t familiar, click here for further background information: https://rachelclearyblog.wordpress.com/2013/09/28/hootsuite/. But again back to my original question though, why is it important to be Hootsuite Certified? For me, there are personal reasons and there are professional reasons. On a personal level, I wanted to learn more about social media and how to manage multiple profiles, because I find it interesting. How can one site, well dashboard, tie all of your social media profiles together and how in the world do you manage all of that? Hootsuite taught me that. Before taking this class I already knew that social media was something that was going to become a part of basically every profession, in some cases, it was almost inevitable that it would. Now over half way through the social media class, I know 100% for a fact that social media is the way to go for businesses to connect and share their content. So this begins to tie into the professional reasons. Professionally, I have thought about being in the social media world, creating and working on a campaign for a company sounds like something I would love. So naturally I wanted to become educated on the ins and outs of managing social media. And now that I am certified I still have the option to go back into any of the videos I watched for a refresher for potential new ideas for future employers. That’s just something, I think, you can’t really put a price on, continuing to learn and create new ideas. Even though, I had not heard of Hootsuite before the social media class, had I eventually heard about it, I really would have paid to become certified. Well here it is! 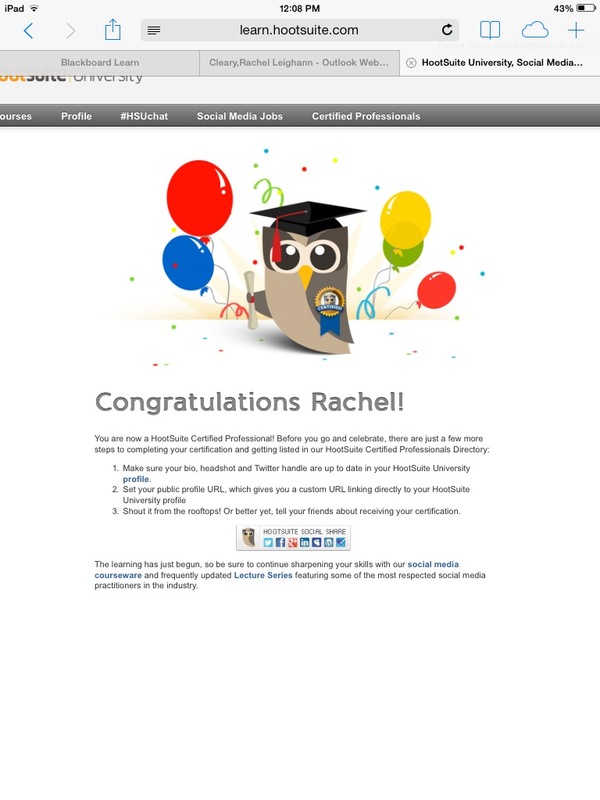 My official badge for being a Hootsuite Certified Professional!